Jacina Carla Scamahorn standing outside of council chambers. It wasn’t the first time Jacina Carla Scamahorn had been beaten up for being who she is, and it happened again last week. But this time would be different. Last Friday a little before 10 p.m. Jacina Carla Scamahorn was waiting for a ride from a friend outside Boot’s Bakery and Lounge. She was chatting with a woman who had asked to touch the fabric of her skirt. “You might not want to touch it because I had to sit in dog piss and trash the last couple of nights because I had to stay outside,” Scamahorn, who has been homeless since 2012, remembers telling the woman. As she chatted with the woman, two men emerged from Zola, a bar next door, who weren’t so friendly. They began berating Scamahorn for being transgender. They told her that she had invited all of her life’s difficulties on herself for not being normal. The woman who had been talking with Scamahorn tried to stand up for her, and that’s when the beating began. They beat her, she says, punching her left eye and kicking her as she fell to the ground. 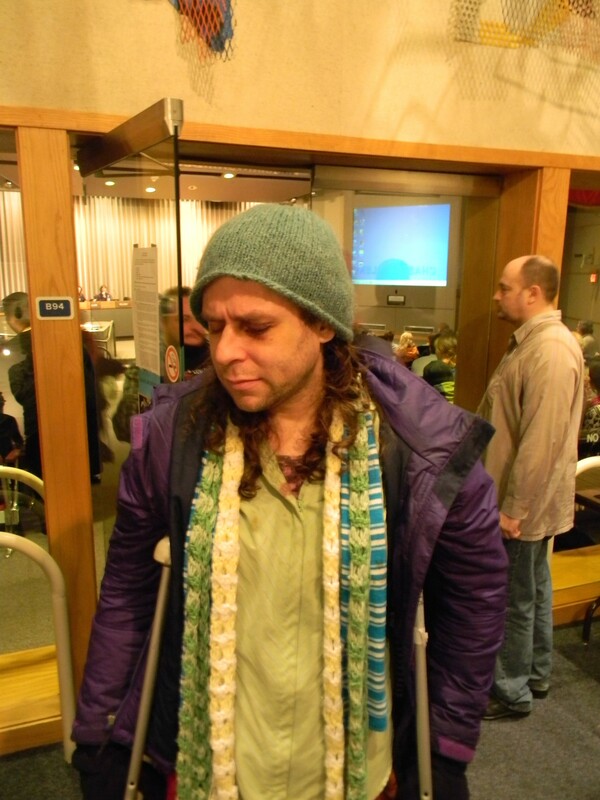 But on Monday, over 100 people showed up to city council to show they thought of Scamahorn as a someone. During the public comment period over 20 people spoke, expressing outrage at the attack, support for Scamahorn and criticism for how police handled it. Blaine Stum, legislative assistant to Councilman Jon Snyder, says he heard about the attack on Sunday in an email from Rick Eichstaedt, the executive director of the Center for Justice. Stum, who chairs the city’s Human Rights Commission, started rallying people to come to city council on Monday to show their support for Scamahorn. Betsy White, a student at Eastern Washington University who has a transgender child, was one of those people. Several speakers commented on Scamahorn’s previous statements that police who responded to the assault had made disparaging remarks about her. “Clearly more training is needed,” Joan Medina, the president and cofounder of the homeless outreach group Brigid’s Cloak, told the council. Scamahorn, who is “33 and a third,” says she has known she was transgender since she was just 2 years old, but didn’t come out until 2012, the same year she became homeless. She’s spent the years since bouncing around between Arizona, Seattle and Eastern Washington. Last year, she broke her leg in a car accident in Tucson and was unable to get adequate medical care for her injury. “Here’s some crutches, good luck,” she recalls the hospital staff telling her. She still needs crutches to walk and stand. She’s been kicked out of social service programs run by religiously oriented nonprofits. She’s slept outside in Spokane in the winter. She’s run into conflicts at homeless shelters over her gender identity. She’s been assaulted before while living on the street. She wants to get proper physical therapy for her leg. She wants to get hormone therapy. Marriage Equality comes to Idaho, but we’re not done yet!